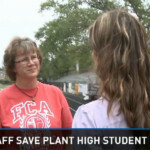 Liz had learned CPR from her Health and Physical Education teacher, Mr. Cory Davis. “Mr. Davis said most likely you’ll never have to use CPR, and if you do it’ll probably be on a close friend or family member,” said Liz. I thought, ‘Wait a minute, am I actually going to have to use it?” Liz and her sister ran over to where the motorcyclist was, who was showing no signs of life. Liz began performing CPR immediately with 30 chest compressions. “If I had to, I was going to do two breaths, but then he started moaning and his eyes were starting to move.” Emergency Responders arrived soon after that and took the man to the hospital. 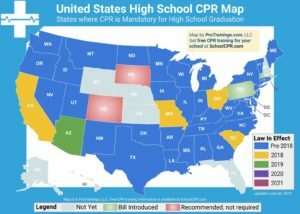 Across the country, states have started to pass bills to legislate CPR training for high school graduation. In Minnesota, where Liz was trained, this requirement goes into effect in Fall 2014. 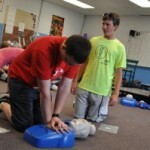 These laws to require CPR training are being met with both support and criticism. It’s hard to argue that CPR training is not important after hearing a story like Liz’s. 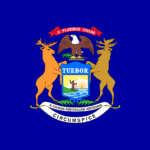 However, many of these bills don’t address the how schools are expected to pay for the training, which can be quite expensive. 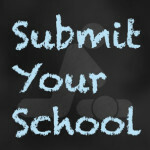 In an attempt to help schools train their students, ProTrainings is offering a free student CPR program for any school that applies. As part of the program, the company will train teachers as skill evaluators to conduct the manikin evaluation for the students. 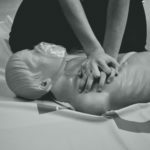 The actual CPR course takes place online with video training and an online multiple choice test. Removing this cost has been a life saver for some schools who were struggling to come up with the funds to implement the training. As of the end of the 2013-2014 school year, over 18,000 students have taken the course. As a result of the mandatory training, Liz and her sister knew exactly what to do to react in an emergency. Misty Morningstar liked this on Facebook. Kim Addicott liked this on Facebook.